The first litter of Seeing Eye puppies in 2014 were born to Netta and Duke in the early hours of January 3. 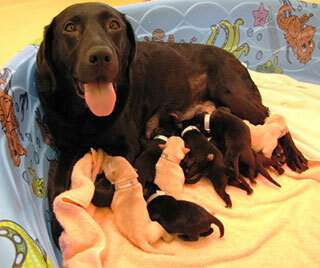 Netta had nine healthy black and yellow puppies: 2 boys and 7 girls. Her puppies came during the first big snow storm of the year, shortly after the Governor had declared a state of emergency and all major roadways were shut down in New Jersey. As demonstrated during Hurricane Sandy, Seeing Eye staff members are the most dedicated dog lovers and will do whatever it takes to be here for their furry charges! The Seeing Eye breeding station is specially equipped with all the necessary equipment to handle whelping and medical emergencies and the necessary accommodations for employees who must stay overnight due to weather.